Send your best wishes with this classic vased arrangement. 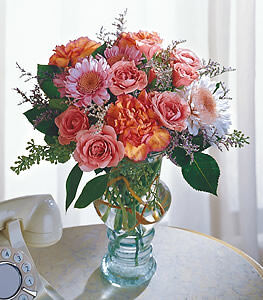 Soft pink roses, carnations, and pompons are accented with limonium and seeded eucalyptus. A sweet bouquet to send for any occasion. Can I just tell you how impressed I am with this service? Ordering flowers for my dinner was nothing I would have ever thought of. The beautiful bouquet I ordered through your site just made my dinner that much more special. Again, many thanks for a fine service.